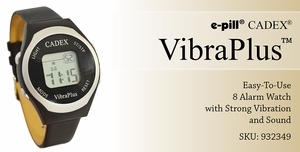 The e-pill CADEX VibraPlus (click on photo to enlarge it) is a nicely designed medication reminder watch (strong vibration or sound), it looks like a normal sports watch; up to eight daily alarms that auto-reset each day a midnight (repeats again tomorrow at the same times) it shows real time, back-light, stop watch and unique Count-Down Timer with "auto start" (interval timer automatically starts and stops at the end of each day). 30 Day Money Back Guarantee! FREE standard SHIPPING (US only). Never forget to take your medications again. Avoid medication errors. Feel better. This watch is for anybody who does not want the world around him or her to know they are on medication. 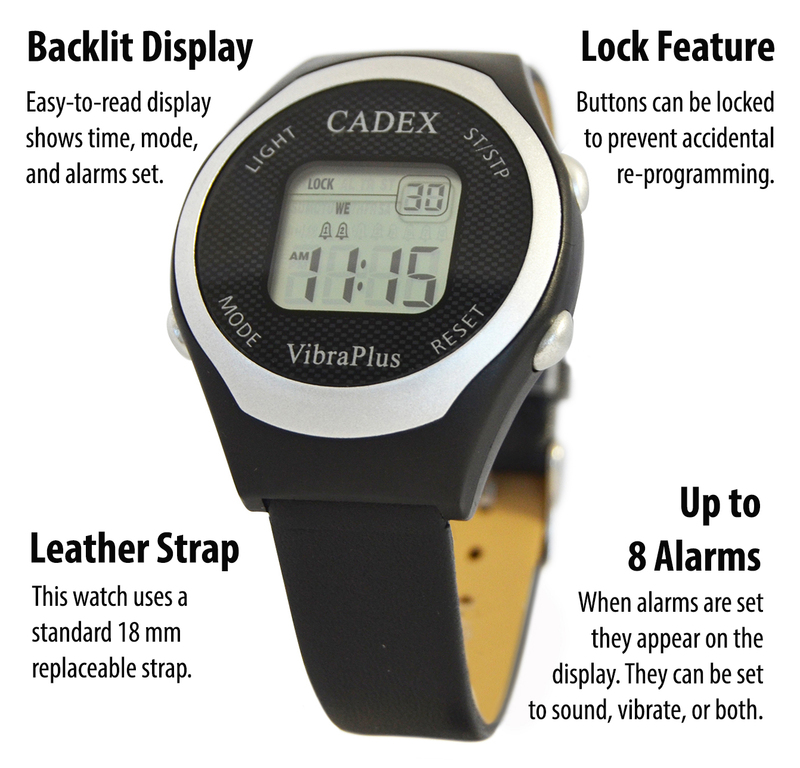 Originally developed for children with diabetes - e-pill CADEX VibraPlus watch vibrates (strong vibration) - time to go to the school nurse & get an insulin injection! Not only for children - this watch style is for adults and teenagers! Great looking sports watch for individuals of all ages. 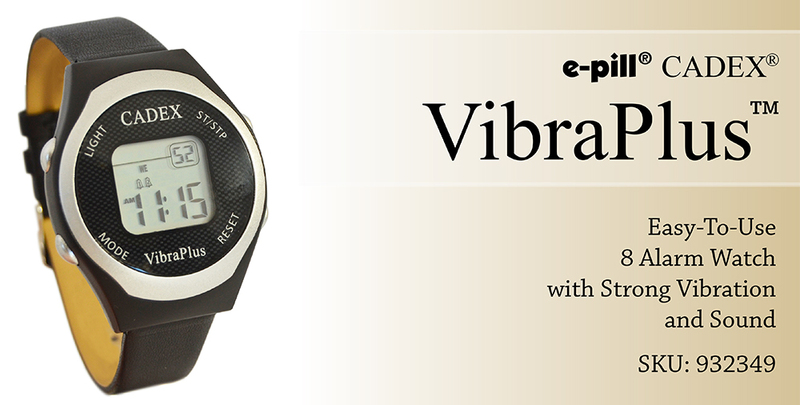 The e-pill CADEX VibraPlus Alarm Watch works as a discreet reminder in meetings, school, church etc. Size is suitable for men, women and children. Color....: Black/Silver with Black Leather Strap. Strap....: Replaceable 18 mm standard strap. Black leather strap included. Battery..: Replaceable CR2032 3 Volt, Battery life 4-6 months. 1 Spare Battery included for FREE and screwdriver to facilitate battery change.